Hey friends! I made these beautiful puff pastry mana’eesh (flatbreads) last week for a brunch gathering at our place. They were a hit! 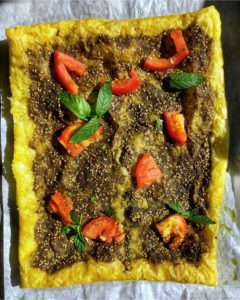 I promised to share the recipe with you guys on how to make these delicious quick and easy mana’eesh using puff pastry rather than homemade dough and here it is. It saves lots of time and will still impress. It is the perfect brunch dish. Guess what? I also filmed my very first Youtube video making this! I thought it would be perfect since its a blend of Western and Middle Eastern flavors all in one dish. I would absolutely love if you guys subscribe to my YouTube channel so you can see more videos! Preheat oven to 320 F.
Roll out puff pastry dough into a 12 x 12 sheet on parchment paper. Mix the za’atar and olive oil together with a pinch of salt to form almost a paste. Mix together all the cheeses, 1/2 tsp salt, 1/2 a minced garlic clove, the egg, and 1/2 tsp dried Italian seasoning. Mix together the tomatoes, 2-3 tbsp of olive oil, 1/2 tsp dried Italian seasoning, 1/2 a garlic minced, and salt together too. Top one dough sheet with the za’atar paste making sure not to go to the edges. You want the edges to puff up like a crust. Top the other dough sheet with the cheese mixture and not going to the edges as well for the same reason. Place on baking sheets with the parchment paper. Bake for 15-20 minutes in the oven. Check after 15 minutes to make sure not to burn the pastry. Once baked through, broil for less than a minute to achieve a golden color on top for the cheese pastry. 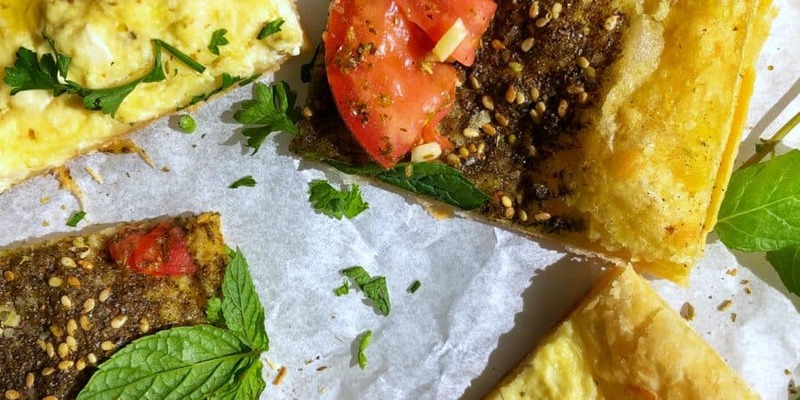 Once out of the oven, garnish the za’atar pastry flatbread with the marinated tomatoes and fresh mint for color. Garnish the cheese flatbread with chopped parsley and a sprinkle of salt. Using a pizza cutter, cut into 9 squares. Enjoy!